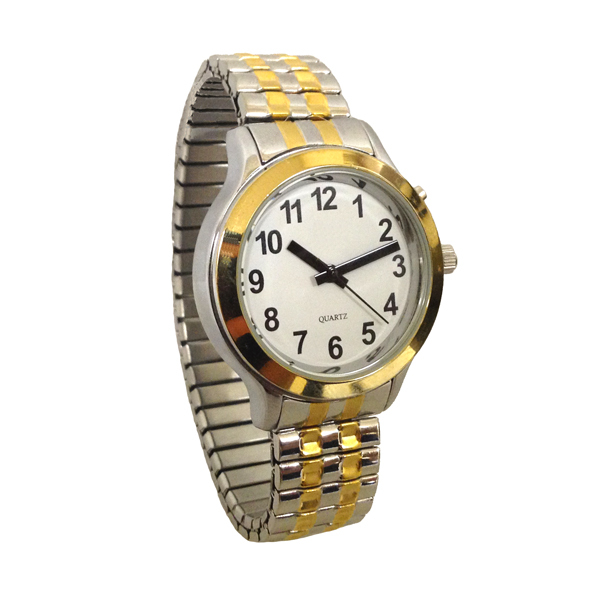 For those of us who wear both gold and silver jewelry, this two tone gold and silver watch will coordinate with any outfit. This talking watch offers a clear male voice, and voice feedback setting. This one button "Simply Talking" watch simply talks, without confusing buttons or settings, and the setting button is recessed to avoid accidental resetting. The classic face is high contrast black numbers on a white background, with bold black hands. The face measures .88 of an inch. A classic design with great, easy to use features! Comes with a elegant expansion band. Would you like us to set your watch prior to delivery? This product was added to our catalog on Friday 04 October, 2013.